Directions (1 – 5): Study the information given below and answer the questions based on it. Ten students Sonu, Tia, Monu, Vicky, Ashu, Ram, Anita, Piya, Arun and Anu are standing in a queue. Each of these ten students studies in different classes from 3rd to 12th. No two students study in same class. i. Sonu is not in 5th class and is standing two places ahead of the student studying in 3rd class. ii. Ram is not standing ahead of Anu, who is standing 2 places ahead of Anita. iii. Five students are standing between students studying in class 11th and class 5th. iv. Piya is studying in 6th class. 1. Who is 8th Class? 2. Who are the neighbours of Tia? 3. Which student is standing first in the queue? 4. Which of the following students is not standing ahead of Ram? 5. Who is in Class 11th? Directions (6 – 8): Study the given information and carefully answer the questions that follow. E is 2km to the west of B. F is 2 km to the north of A. 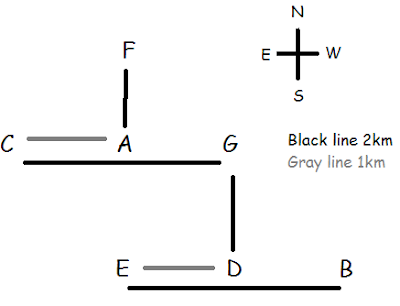 D is 2km to the south of G. C is 1 km to the west of A. G is 2 km to the east of C. D is exactly in the middle of B and E.
6. How far is E from F (in km) as the crow flies? 7. Which two villages are the farthest from one another? Directions (9 – 10): Study the following information carefully and answer the given questions below. In a family of six members P, Q, R, S, T and U. There are 3 males and 3 females. There are 2 married couples and 2 persons are unmarried. 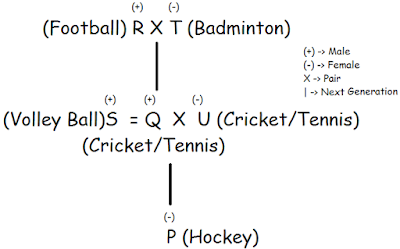 Each one plays a different games- Football, Cricket, Hockey, Tennis, Badminton and Volleyball. Following are the facts about the family R who plays Football is the father-in-law of U who is the wife of Q. P is S’s niece doesn’t play Cricket or Tennis. Grandmother plays Badminton. Q’s Brother S plays Volleyball. 10. How is R related to P?